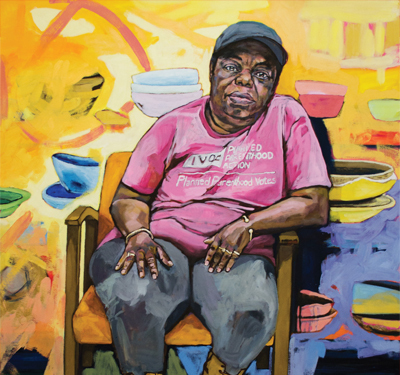 Natalie Voelker’s exhibition, Fortitude: Portraits of the Perseverant, is a collection of large-scale portrait paintings depicting the complexity of human experience through the lens of the intimate, personal, and specific. The subjects are possessors of fortitude – the courage to persevere when faced with pain or adversity. Painted on loose unstretched canvases, these life-size, full-body portraits imply ambiguous narratives; viewers are faced with reconsidering their first impressions. These works elevate the assumed mundane and invite viewers to look more deeply and compassionately at their fellow human beings. Depicting local women – a friend’s mother, an intriguing woman seen on the evening news, acquaintances, and friends – Voelker’s paintings honor the fortitude of people around her. Without revealing the details of each subject’s story, these works allow the viewer to contemplate the meaning of fortitude and the circumstances under which it is ignored, acknowledged, or celebrated. Natalie Voelker creates emotionally and psychologically engaging portraits of seemingly ordinary people. Having met and worked with people on 3 continents, she conceives of our human experience as both uniquely specific and shared via a visceral emotionality. Her work has been featured in multiple publications including the anthology, BARED, and the French-English magazine, VolUp. She has produced commissioned works for the Harwood Art Center, 508 Mural Festival, the City of Albuquerque, and various private collections. Her painting, Ethan Sleeping, was selected as the featured work for the state of New Mexico by Figure50.com, a national juried figurative art competition. In addition to her art practice, Natalie teaches workshops, ongoing classes, and individualized private art instruction. She has a BFA from the University of Wisconsin and currently works out of Albuquerque, NM.